New Garden Township municipal offices are located at 299 Starr Road, Landenberg, PA 19350; phone: 610-268-2915. Photo: Merestone (John S. Reese IV House), ca. 1942, Yeatman's Station Road, New Garden Township, Chester County, PA. Listed on the National Register of Historic Places in 1995. Photographed by User:Smallbones (own work), 2010, [cc-by-1.0 (creativecommons.org/publicdomain/zero/1.0/deed.en)], via Wikimedia Commons, accessed June, 2013. Although Mary Rowland bought land here as early as 1708, the first permanent colony in the present New Garden Township was founded in 1712, when a noted minister in the Society of Friends, John Lowden, settled there with several families of Friends from the county of Carlow, Ireland. 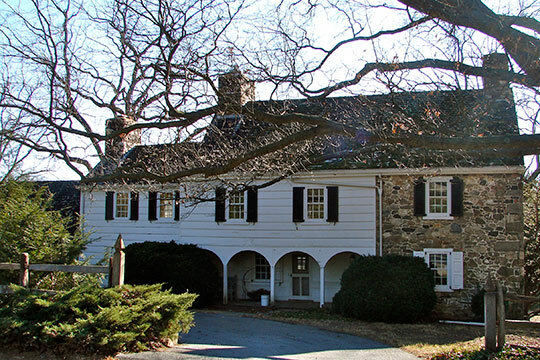 The township and its principal village, on Newark Road in the southeastern corner of Chester County, was named New Garden at Lowden's request, in remembrance of their place of worship in Ireland. Listed on the National Register of Historic Places, Merestone was initially built in the 18th century. However, it's historic significance relates to the 1941 Colonial Revival redesign by Philadelphia architect Richardson Brognard Okie (1875-1945). Okie retained the integrity of the 18th century bank house as well as its floorplan. He integrated the ruins of the barn into a guest house/garage.